Milk Fat Globule-EGF Factor 8 Protein (MFG-E8), also known as Lactadherin, is a pleiotropic secreted glycoprotein that promotes mammary gland morphogenesis, angiogenesis, and tumor progression, inhibits blood coagulation, and can be cleaved to release an internal amyloidogenic fragment known as Medin. MFG-E8 also plays an important role in tissue homeostasis and the prevention of inflammation.1 It contains discrete domains that enable it to serve as a bridge between apoptotic bodies and phagocytes. The discoidin domains bind to phosphatidylserine (PS), which is exposed on the surface of apoptotic cell bodies but not on viable cells.2 An RGD motif (Arg-Gly-Asp) then mediates binding of MFG-E8 to Integrin alpha V beta 3 or alpha V beta 5 on phagocytic cells, triggering the uptake and destruction of the apoptotic material.2, 3 Clearance of apoptotic bodies prevents their transformation into necrotic masses and thereby prevents the inflammatory response that occurs surrounding tissue necrosis. Apoptotic cells are generated during normal tissue homeo­stasis and do not trigger inflammation. An additional mechanism for MFG-E8 mediated tissue protection has recently been described, one that does not rely upon clearance of apoptotic bodies or binding to the above mentioned molecules. Based on the known functions of MFG-E8, Atabai et al. 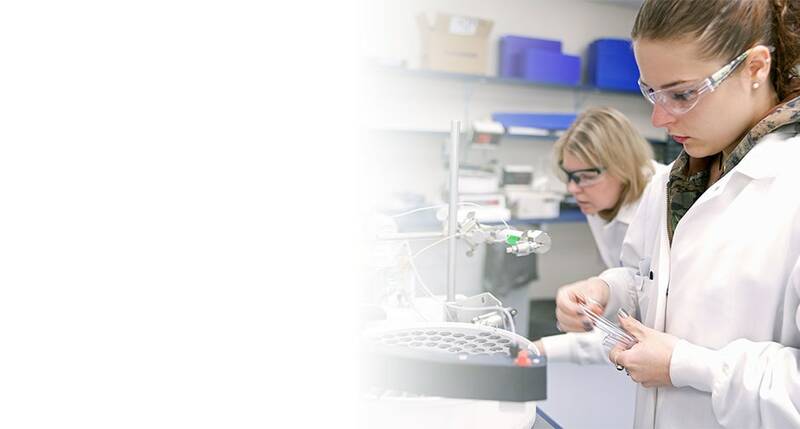 investigated whether it could be involved in the development of tissue fibrosis that can result from increased apoptosis and inflammation.10 These authors employed a mouse model of bleomycin-induced pulmonary fibrosis, which is characterized by a buildup of interstitial Collagen. MFG-E8 was upregulated following bleomycin treatment, and mice deficient in MFG-E8 expression showed exaggerated fibrotic responses. 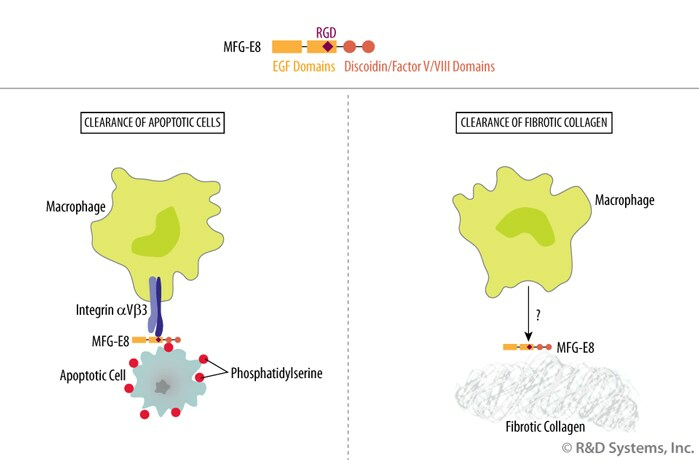 Despite these observations, MFG-E8 did not appear to mediate the clearance of apoptotic cells. It did, however, affect the accumulation of Collagen. MFG-E8 participated in the removal of excess Collagen from fibrotic lungs, while its presence did not affect the rates of Collagen synthesis or degradation. The interaction of MFG-E8 with Collagen was mediated by the first discoidin domain, which is consistent with the Collagen-binding function of discoidin domains found in other proteins. MFG-E8/Collagen complexes were subsequently cleared by macro­phages, although this did not involve the RGD motif of MFG-E8 or any of several integrins tested (including alpha V beta 3 and alpha V beta 5). View Larger Image MFG-E8 Functions as a Bridging Molecule to Mediate Phagocytic Clearance of both Apoptotic Cells and Excess Collagen. MFG-E8 mediates the clearance of cellular debris by binding to phosphatidylserine on apoptotic cell bodies and Integrins alpha V beta 3 or alpha V beta 5 on phagocytes. A similar bridging function helps to alleviate fibrosis by binding of MFG-E8 to excess Collagen and unknown molecule(s) on macrophages. Fonseca, C. & G. Dranoff (2008) Clin. Cancer Res. 14:1603. Hanayama, R. et al. (2002) Nature 417:182. Akakura, S. et al. (2004) Exp. Cell Res. 292:403. Hanayama, R. et al. (2004) Science 304:1147. Kranich, J. et al. (2010) J. Exp. Med. 205:1293. Ait-Oufella, H. et al. (2007) Circulation 115:2168. Kranich, J. et al. (2010) J. Exp. Med. 207:2271. Aziz, M.M. et al. 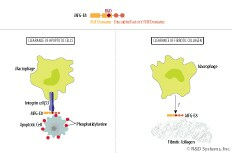 (2009) J. Immunol. 182:7222. Bu, H-F. et al. (2007) J. Clin. Invest. 117:3673. Atabai, K. et al. (2009) J. Clin. Invest. 119:3713. This symbol denotes references that cite the use of RnD Systems products.